The initiative speaks to the root causes of why volunteers need to risk their freedom in the first place! Volunteers feel an urgency to brave EU seas because of the collective failing of our EU governments. People continue to drown. A lack of EU rules disempowers ordinary people who want to help by providing their homes and safe passage. The European Citizens’ Initiative calls for precisely such rules, so that ordinary people can open their own homes to people. Rescue volunteers like Manuel won’t be able to rest until people fleeing war don’t have to risk their lives just to reach refuge. We know European Citizens’ Initiatives can work, and that our community can make them work! We led one last year and dealt big blows to Monsanto. This was due to our community, our partners,  and 1.3 million EU citizens who signed. Now we can do it all again, this time to ensure our life-saving volunteers are no longer criminalised in Europe. The WeMove community came together to help such volunteers in the past. With our partners , we built a wave of support that brought Manuel all the way to the EU Commission in Brussels in 2016. Although the Commissioner for Migration acknowledged the problem, the EU left him to face prosecution by Greece. but we didn't let him stand alone. People like Manuel have shown us that there is another face to Europe. If we come together again now, we can tackle the root of the problem by changing EU law. If people fleeing war and persecution have safe ways to reach Europe, volunteers like Manuel will no longer have to risk their freedom to save others. The European Parliament banned Monsanto lobbyists, and now has a special committee investigating pesticides! It is an outrage that some authorities are trying to stop citizens from giving humanitarian aid! ECIs can only be on a topic or policy that the European Commission has the power to legislate on. The WeMove community came together to help such volunteers in the past. With our partners , we built a wave of support that brought Manuel all the way to the EU Commission in Brussels in 2016. Although the Commissioner for Migration acknowledged the problem, the EU left him to face prosecution by Greece. We can’t let him stand alone. Our WeMove community stands side-by-side with life-saving rescue volunteers on the Mediterranean, and citizens who want to contribute to solutions in their own communities. That’s why we’re helping our partners to organise this European Citizens’ Initiative. But an ECI is a massive undertaking, and effective campaigns need funding. In order to be ready to mobilise and put pressure when and where it’s most needed, we need the stability and flexibility that only be provided by small regular donations from people like you in the WeMove community. Can you chip in just a few euros each month to help us achieve a welcoming Europe? Manuel was arrested - for saving people from drowning. Sign the ECI now so rescue volunteers like Manuel can never be turned into human smugglers. 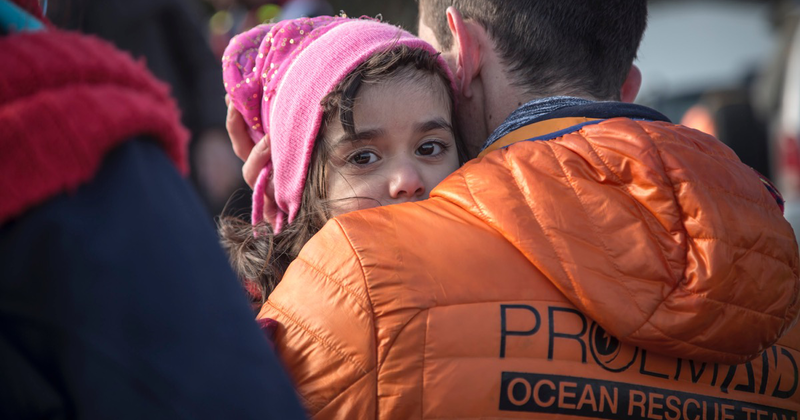 Thank you for continuing to stand side-by-side with volunteers at sea and people fleeing for their lives. If we all stand up for a welcoming Europe, we can change EU migration law. We know European Citizens’ Initiatives can work, and that our community can make them work – we led one last year and dealt big blows to Monsanto! But in order to force the EU to respond, first we need 1,000,000 signatures. Will you help by sharing this action? Thank you for continuing to stand side-by-side with volunteers at sea and people fleeing for their lives. If each one of us stands up for a welcoming Europe, together we can change EU migration law for the better.